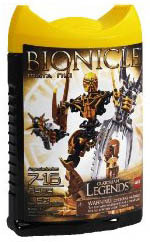 Once the Great Spirit of the universe, Mata Nui's realm and power have been stolen. Now trapped on Bara Magna he must unite it to save the universe armed with the Mask of Life, a scarab shield, and a spiky Thornax launcher. This playset combines the building creativity of Lego with the imaginative mythical world of Bionicle.